I took Dazzle to his first Agility show this weekend (since his NQ debut run last year at Malinois national). I ordered several really nice photos (including the one above) from the pro photographer, so I'll add those as soon as I get them. The one above is a proof. As a preface, I have not been exercising Dazzle for the past week because the previous week he started limping a bit. I thought he had bruised the pads of one foot, but since trying to keep him from running around is like trying to stop the earth from turning, it took awhile for the limp to go away. He hadn't been limping much by the time he got his chiropractic exam, but the vet said one of his toes looked swollen (but wasn't sure of the cause). Said it wasn't broken, so that was good news! He prescribed some stuff to put on it and it seems to have worked! I was afraid to exercise Dazzle before the show for fear he would start limping again, so he went into this weekend with about a week of pent up energy :-) Sorry Sarah! Saturday morning started at 9:30 for us with a F.A.S.T. run. This is a "points" game with each obstacle worth a certain number of points. It also includes a "challenge" that must be completed correctly to Qualify. Goal is 50 points in a set amount of time. For each second over time, you lose one of the points you earned with the obstacles. Dazzle was CRANKED!! Sarah really had her hands full trying to contain him and get him around the obstacles. Thankfully there is no set course. 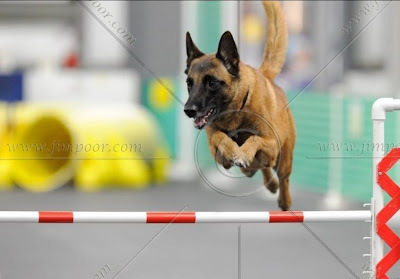 Each handler gets to pick which obstacles they want to use and in what order and if a dog makes a mistake like a dropped bar, it simply doesn't get the points on that obstacle. But of course Dazzle decided to knock down the single bar jump that was worth NINE points! Couldn't have been a ONE point jump, Noooo. In his excitement, he also jumped off the A-frame missing the down contact, so those points didn't count either. :-( Anyway, Sarah managed to get him exactly 50 points, but they were on the other side of the ring when the buzzer sounded. So there was a 7 second penalty as she tried to get Dazzle back to and over the last jump (which he ran past on the first attempt). So he didn't get enough points to qualify, but he had a LOT of fun!! I had to stay put by the entry gate so Dazzle could see me, so the video is not from a good angle. Then, because of the way the classes were arranged, the next Novice class wasn't until after 4:30 pm! So we did a lot of sitting around and watching and I helped when needed. Thankfully, we were in the new building that had great A/C, so it was a comfortable wait. I had brought in Dazzle's big crate, so he was able to stretch out and relax. The second class was "Jumpers with Weaves". As it sounds, it is only jumps, weaves and tunnels. A VERY fast course because there are no obstacles where the dog stops or pauses. Because of the long wait, I spent some time getting Dazzle more "up" thinking he would do better. He was plenty pumped up and ended up knocking bars on 2 jumps trying to go too fast. In this class, dropped jump bars mean NQ. His third class was the last one of the day and started after 7pm. The start was a total disaster! Dazzle grabbed the leash as Sarah was trying to get it off him and yanked on it. She tried to hold on and his collar slipped off (since I switch to a buckle, instead of his martingale) and he proceeded to jump the first jump (the tire) carrying his leash proudly! I helped clean up, and then we headed home. Got to bed late and about 4am, the thunder started. Dazzle jumped on my head and I had no choice but to get up, put on his thunder shirt and sit up with him till the storm passed. After the worst of it was by us, I did manage to get another hour of sleep, but was NOT ready to get up when the alarm sounded! I ended up packing my cot and my pillow because I knew there was no way I was getting through the 6 hours between classes without sleep! The show was in the same order as yesterday, starting with FAST. I changed my "warm up" tactics to doing my best to keep him calm. I had him do a little bit of leg weaves and spins and did some hands-on stretches, a few warm-up jumps and then calmed him till it was his turn. I also switched to a very short traffic lead. I sprayed this with bitter apple just in case Dazzle got it. But Sarah was able to lay this along his collar and Dazzle couldn't get it. She lead him in by the collar and had him sit/stay before she took off the leash and quickly got it out of his reach. I didn't really care if he Q'd, we were only using this to try out the new entry plan (which worked great!) and to work on his contacts and getting him to slow down a bit. It all went beautifully!! He not only Q'd, he got 2nd place! What a difference! Not sure if the full day yesterday and lack of sleep overnight had anything to do with it though :-) At least for future shows I'll be able to give him his usual workout on the days prior. Then we had the 6 hour wait and I got a 3 hour nap on my cot :-) After my nap, Dazzle thought the cot was THE place to be! The second run of the day was a not so easy Jumpers course. There were a few places where if he got up too much speed, he would take the wrong obstacle instead of the 90* left turns. We repeated the calm warm up and entry and Sarah worked on keeping him steady and not letting him get too far ahead. He nailed the first left turn perfectly, but on the way back, he missed the turn to the next jump he was supposed to take when Sarah tried a rear cross. No prob, he didn't take the wrong jump, so that's only points off and it actually set him up to do a better entry to the correct jump. It was a really pretty run and he was clearly thinking. We haven't practiced rear crosses much, so that's what threw him a bit. But again he qualified and even ended up with 2nd place! While we were waiting for Open level Jumpers to finish, a big, loud storm blew through and Dazzle was in his thundershirt till just before his run. Thankfully for us, the storm was over just as quickly as it started and by the time of Dazzle's run, he was fairly calmed down. I didn't know how the adrenalin dump would affect his run, but apparently not too badly :-) He had a perfect run and got first place!! The course time was 64 seconds and he did it in 36:68 (and that was with Sarah trying to steady his speed!) Because he got 2 Q's (3 actually) in one day, he got an extra "double Q" ribbon. I am SO proud of him!! And so glad Sarah was willing and able to stick around for the Novice runs that made her day much longer than it otherwise would have been. I'm really sorry her dog didn't double Q today for her MACH, but I'm certain she will get that at the next trial!! Wish I could be there to see it.